Early Tuesday morning, November 2, 2010, Baytown police were dispatched to an unusual scene at ﻿Slapout Gully Crossing on Decker Drive in Baytown, Texas. 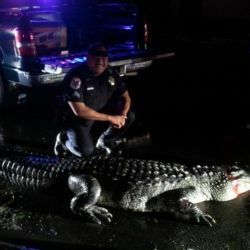 There they discovered an 11-foot alligator resting on the road. The alligator was first spotted by the driver of an 18-wheeler who then notified police. The game warden was dispatched to the scene. The alligator was noncompliant and had to be shot by the game warden.